I am here back with a post about shoes. I am a huge lover of shoes and sincerely I am here thinking about new shoes. And that is because I love it the shoes I could use a different pair each day If I had the money for that. I am talking about this new webstore for me and my first time publishing a post about this interesting and great webstore called Chamaripa. For me that is a very interesting name about how that sounds in Spanish (remembering that the Spanish is my first language). 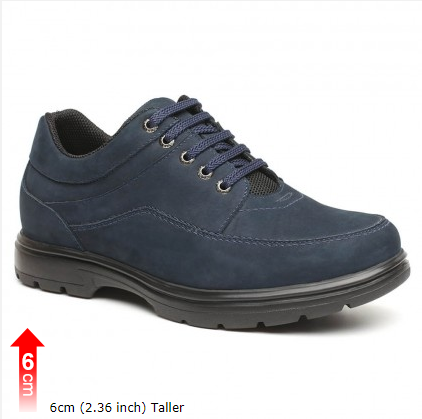 But back to this post this webstore of shoes is dedicate to create amazing elevator shoes for men. And probably someone is gonna ask, seriously? elevator shoes? But yeah that is not something new and very popular between those men that are not so tall. I love it these cute casual shoes. 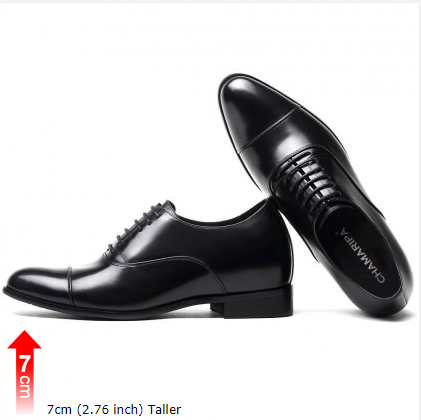 Something I guess is really amazing is the fact that they provide quality and that in each product tell you what quantity of centimeters the shoes is gonna elevate you. I guess is great because the shoes are like heels without to look like heels. I was reading in the webstore how the actor robert downey jr height and how he use these type of shoes and I find these very interesting because he looks tall in so many pics but this is the reality and why not? If the woman can use heels for look better for an outfit he can too. I found these cute heart shoes that makes you look 7 cm taller and that is great I was thinking that probably despite the platforms these are the type of shoes that use the korean actresses for reach some male actors because they are really tall. My boyfriend is 5.9 foot and I am 5.3 foot so I am always looking for heels and platforms for not look like a minion next to him. I hope this post can be useful even If you are not looking right now for this type of shoes is always good have a reference. I hope you have a nice day! I am very happy because despite I was very sick the past days before that I recorded and take cute shots for this review. But obviously that need times for edition and all that. 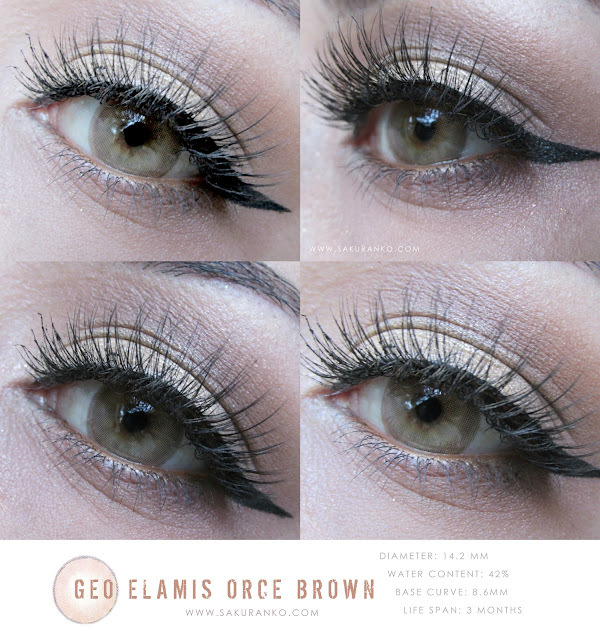 Thanks again to PinkyParadise I have the opportunity to try this cute new model of circle lenses Geo Elamis Orce Brown Circle Lens. First I must confess I love it the little box the color and the design is really pretty. The bottles are nice but I had accidents in the past so now I am more fan of blisters now. This design of circle lenses is inspired in a powerful woman in that woman that we want to be. So like always all the opinions in this reviews are based in my own experience with this product. ◗ Design/Pattern + Color: These circle lenses are a two tone lenses with only two colors. A medium pinkish brown shade with a light thin gray edge. I love it how the cloudy medium beige brown blends pretty well with my natural green/gray eyes so I really like that effect. The color is not so vibrant but like is more light than natural brown eyes makes the look pop. ◗ Comfort: After two hours these circle lenses were pretty uncomfortable for me so I needed eye drops for moisture my eyes. So my recommendation, please use moisturizing eye drops. ◗ Enlargement: The enlargement is subtle but is there. There is something with the light colors of circle lenses and this is the case. If the color is light provides more luminous and brightens the look in the eyes even when the diameter is not so big. ◗ Overall: I really like how elegant is the effect of thse circle lenses. The cloudy effect and how blends so weel with my natural eyes is something I love it! I used a strong makeup with these lenses because the cloudy effect and the color like is very subtle I want produce a contrast. I guess these are great circle lenses not only for cosplay but for a more casual and girly look. The only cons is the fact that these circle lenses for me are not so comfy. But always take in consideration I have sensitive eyes. But I really like the design. I´ve been something disappeared the last days and the reason is because I was very sick and I´ve been working and believe me that is a very bad combination. Because I suffer of rhinosinusitis and currently is rainy season so I´ve been pretty sick without can smell or breath properly the last weeks. Thanks to my collaboration with Jolse I received this product in June and I´ve been using this product over a month until now so in that way I can share my experience. I was a little worried about this serum because I´ve read some reviews about many people with normal skin using this product and having bad experiences. I have great expectations with this product since I used the OST C20 Original Pure Vitamin C20 Serum now called TIAM My Signature C Source 30ml. The vitamin C in different ways is always my must have for my skin. This is like an upgraded formula because contains the same 20% Pure vitamin C and plus Vitamin B12 and glutathione. So let´s go to know what´s up with this product. Concentrated vitamin C, B12, and glutathione soothe the skin with powerful whitening effects. Prevents skin pigmentation and skin troubles by suppressing melanin formation and transference. Anti-oxidant effect helps collagen synthesis that strengthen the damaged and stimulated skin.Pure vitamin C 20%, glutathione, and niacinamide improves the dull skin tone clearly and brightly. The light red color comes from vitamin B12 - a naturally red vitamin that calms the troubled skin. Concentrated gel type texture smoothly conveys firm nutrition and skin-protective vitality. 1. 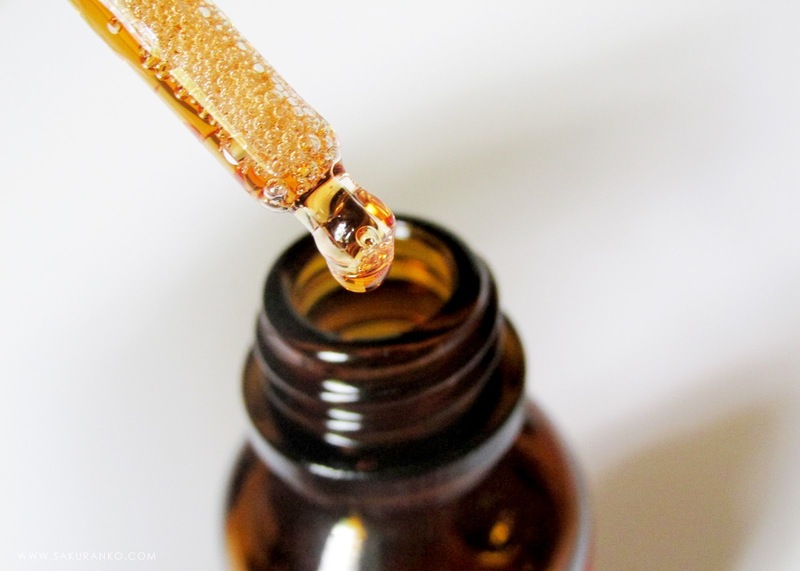 After cleasing and toning, dispense 2~3 drops and then apply to your face. Lightly tap the area to be fully absorbed. - If your skin is sensitive and if you use pure vitamin C product for the first time, you can mix 2~3 drops of the serum into your toner or moisturizer. - Use underneath your moisturizer to penetrate into the deeper layers of your skin. Caution: Sediment may occur in the bottle neck and bottom but is safe to use. Browning liquid is natural phenomenonof highly concentrated vitamin C.
Storage: Store in a cool and dry place or refrigerator with taking into consideration of pure vitamin. 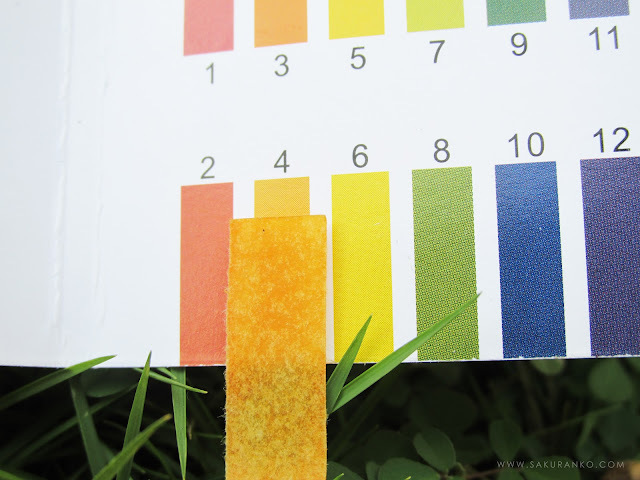 Water, Ascorbic Acid (20%), Niacinamide, Sodium Lactate, Glycerin, 1,2 Hexanediol, Glucose, Butylene Glycol, PEG-60 Hydrogenated Castor Oil, Sodium Hyaluronate, Hydroxyacetophenone, Xanthan Gum, Diethoxyethyl succinate, Glutathione, Cyanocobalamin, Citrus aurantium dulcis, Panthenol, Lactobacillus, Camellia Sinensis Leaf Extract, Beta-Glucan. ҂ Texture and Color: The color is very reddish to orange shade. And this is very confusing because the product says that the red color is due the Cyanocobalamin (Vitamin B12) I´ve been checking other reviews and the color is similar to this but in the official video review the color is absolutely red. But I guess that the orangish color is due the oxidation of ascorbic acid because this product was several months until reach to me. The texture is like a super liquid and light gel. The absortion is quick, after 5 minutes is absorbed the most quantity of product. - Provides a luminous effect. - Controls the excess of sebum. 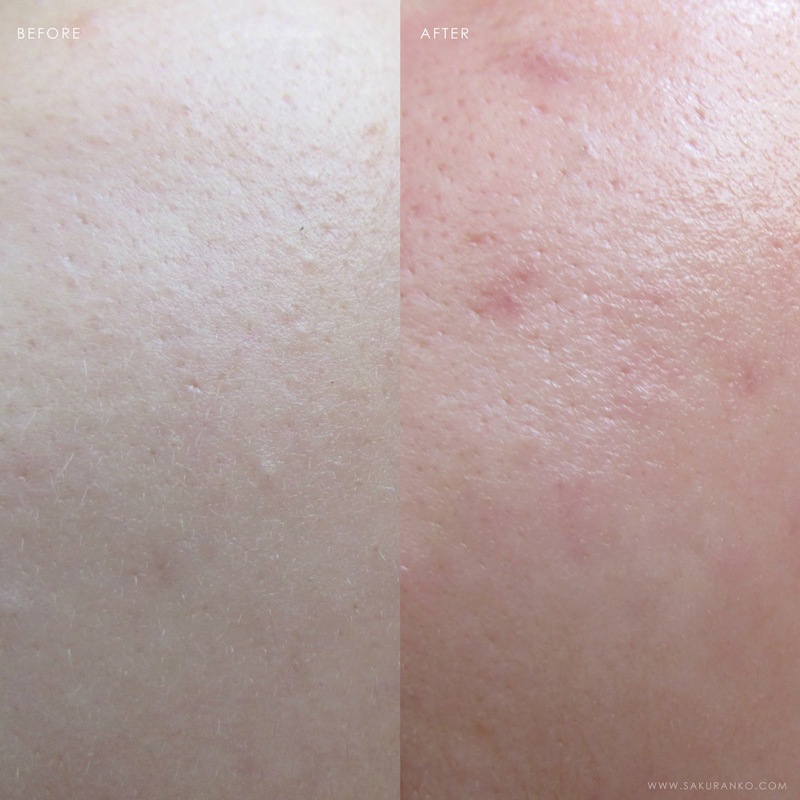 - Helps to heal the old acne scars. - Reduce the size of the pores. - The odor to rusty coins can not be very pleasent for many people. First I need start to talking about the ingredients of this product and the reason because I wanted try it so much. The first is ascorbic acid that is in a concentration of 20% in this serum and this antioxidant helps to the skin produce more collagen and that in effect to long term enhances skin firmness. I feel my skin more tight after use this product over a month. 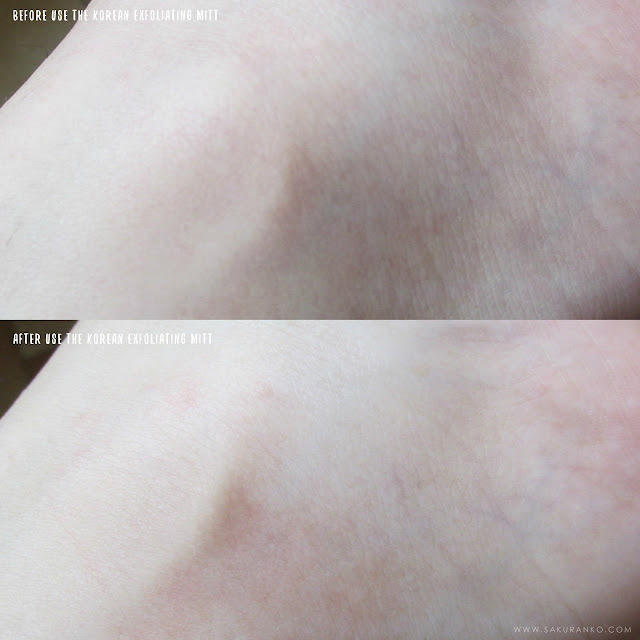 The vitaminc c helps to fades the brown spots and old scars so this is really amazing. The only problem is that is very unstable and oxidizes very easily with hight temperatures or the light. But even when this spent a lot of time to arrive to me because went to The Customs the products works pretty well. But the color is not that sweet red syrup that is promoted ine the website. So the pricipal ingredient the ascorbic acid works pretty well in this serum. Now I knows that this product says Vitamin B12. But befre of that vitamin in this product is the Niacinamide that is Vitamin B3 one the stars of my skin care routine because is a great antiaging, improves the skin barrier and reduce the redness and imrpoves the complexion a lot. I love use two or more product in my routine. Glutathione non-enzymatic antioxidant very powerful that helps to reduce the redness and provides a brightening lool to the skin and work better in combination with the other two products. So this product has great ingredients in combination. I wanted say all that but the real question is: This product really fullfils all these promises? And yes. That is truth, I started to using this product a month ago but like I knew I was to going to use a new product into my routine, beucase obviously I use the vitamin C of Tiam before but not this red serum with this new formula I spent like a week without using other serums. I did the patch test and I was allright so I decided use this product to the next day to my patch test. The first day and yeah the first week I used this product I felt a little tingling in my skin and a little of warm from my skin. It was not painful but It wasn´t nice either. But the second week using this product the tingling It wasn´t. So using this product daily, I found some days I feel tingling and other I don´t feel nothing. I guess is because my skin is sensitive and happens due the sensitive reaction. But I must clarify that It wasn´t nothing serious because after few minutes the tingling dissapears. But If you have oily/ combination sensitve skin like mine I really recommend be careful with this product and introduce this product to your routine with caution. I am not happy with the reddish color. Because I stained my pillow and believe me that it is not an easy spot to remove, in fact I didn´tremove it completely. The odor, this smells like a mix between multivitamin of complex B with rusty coins. I am used to this smells because I am a physician and that mutivitamin is very popular known and used in kids. But probably If you are not used to this odor. Probably you can not be very happy with something that smells like medicine and the odor doesn´t fades so easily. In overall I am very happy with this product. This helped me to improve my complexion, reduce the redness, heal very quick the acne scars or pimples scars. I remember that my first post about vitamin C was around 2011. And It´s amazing how the ascorbic acid has revolutionized until today and I keep using the vitaminc C. So I really recommend this Red C Serum because is great. The only thing I can say is that the brightening effect is less with this serum than the other serum of TIA'M that is pure Vitamin C. Definitely this is a must have. Another great point about this serum is the pH thanks to the ascorbic acid this serum has a pH 3.5~4 that is amazing for balance the pH of our skin. I want to have another bottle of this serum already because I really love it how great this work on my skin and this conclusion was really long so for finish I recommend this product to 100%. ٩(^ᴗ^)۶I am very happy to finished this review. I hope this review can be useful to you. It´s again that season of the year when the only I have is allergy all the days all the time. And sincerely to this point is not flu is just allergy due the rainy season but I can´t do anything that work the best I can. But letting that to a side today I am very happy because I am going to share beautiful cardigans for women from the great webstore Berrylook. I love it the cardigans and I have few cardigans but I am very happy with them. And I guess is a guess and easy simple to make a cute style. My first pick was this gray with V neck that I found very cute. This black cardigan looks like a little jacket and is so girly and pretty. I could be happy to use something like this with a dress or a cute blouse. I am in love with this and is probably one the items that goes directly to my wishlist. I have a long wishlist and each month a pick few items from my wishlist. So this goes directly because I want something really cute like this item. And this cute last but not least important cardigan. The color is so wondefrful and the design is so subtle and cute. I am in love with this long design because looks so subtle and cute. So like always I want to know in the comments If you have visited this webstore before and which between my picks is your favorite cardigan. Like always I hope this post can be useful to you. I hope you enjoyed this post and I want wish you a happy day. Today I am here with a short review about a very interesting korean product that is super popular and I am talking about the Korean Exfoliating Mitt aka Italy Towel. That is know too like the Korean Exfoliating Glove that is exactly the Korean Exfoliating Scrub Bath Washcloth this simple mitt has several names but is exactly the same use. I´ve using this product since several years ago. Around five years ago and I realized that I never published a review before about this product. The use of this glove is basically exfoliate the body skin of the dead cells. Since I was a little kid my mom always told me that I needed scrub very well my skin when I was showering me because is that way to be really clean and my mom wasn´t wrong. What have this mitt of Special? Probably are you asking, this is from Italy? What made this mitt so special? This is made of viscose that is a type of rayon that was originally produced and imported from Italy because it was called the Korean Italy Towel. Several years ago this product was a boom. Because the exfoliation is so important in the korean spas. Removing the dead cells makes you skin looks more healthy, luminous and pretty and you can easily exfoliate your body with this product. First you need to have shower at least during 15 minutes. And after that when you are wet you start to rub your body with this glove with circular motions removing the dead cells. The towel must be dry when you use it in your wet body, and you can see how the dead cells start to fall. For a better result use hot water for your bath. - Removes the dead cells. - Provides a good exfoliating. - This product is reusable. If you want to know a little about korean culture I want talk about the jjimjilbang that basically is a public bath house and there is a very popular treatment that is basically a full body treatment of exfoliation. So you are naked like in a massage table and this professional person in the spa is going to rub all your body with some of these korean towels. But this remember me when I was a little kid and my mom used a natural fiber of a local plant and exfoliated all my body specially my arms. Sincerely I hated that but now that I am an adult I am doing the same thing with myself with this towel. I loved use this when I am wet after shower but I love use this with cream. 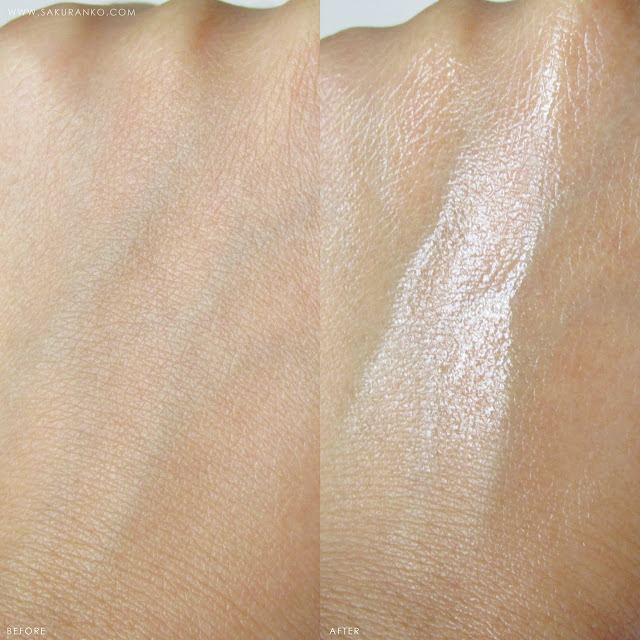 Sincerely the luminous effect is amazing and this is a product really cheap. The price is around of $5 USD for a set of 5 towels. I remember the first one that I used was a gift from a korean webstore and after several months I repurchased this item because is so nice for my body exfoliation. And the last year I received again this product with a haul from Jolse the last year. By the way I suffer sometimes after shave my legs with razor of folliculitis that is a bad and annoying irritation of the skin of my legs. 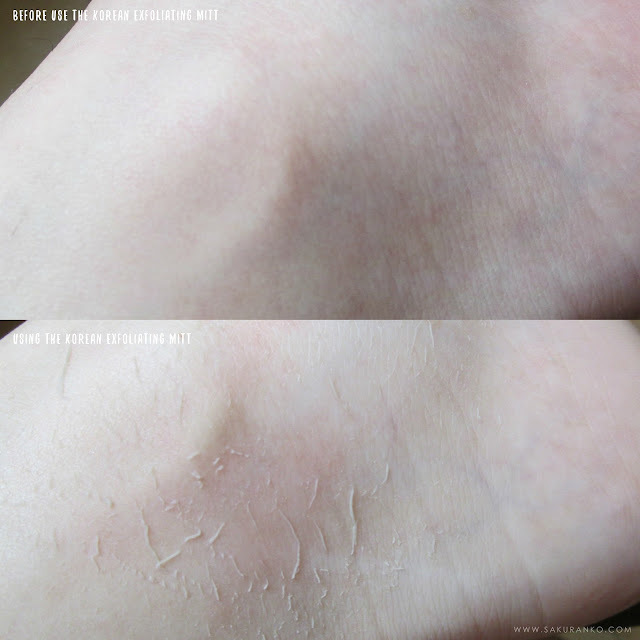 But I notices that exfoliating my skin with the korean mitt a day precious to shave my legs I don´t have the abnnoying folliculitis. Like I mentioned before I use this more in my arms and legs but sincerely I don´t feel clean If I don´t rub all my skin. This is a very good investment and by the way you can´t use this product for your skin face because can be very abrasive. And If you have a sensitive skin there is a cherry mitt that is designed for sensitive skin. I love use this product specially on my elbows with cream for sof elbows. So I really recommend this product I hope you can find this review useful.